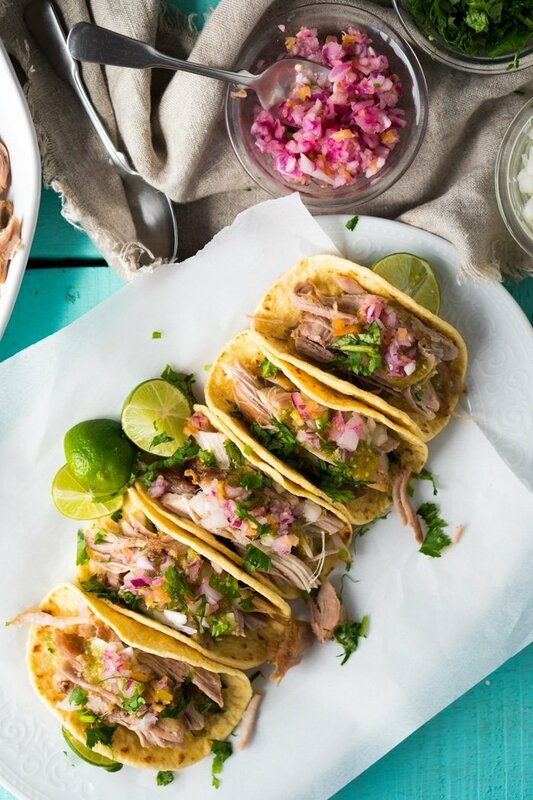 These instant pot paleo and keto carnitas are the speedy (and easy!) version of this stellar Mexican dish. Ridiculously tasty and tender for the ultimate tacos! 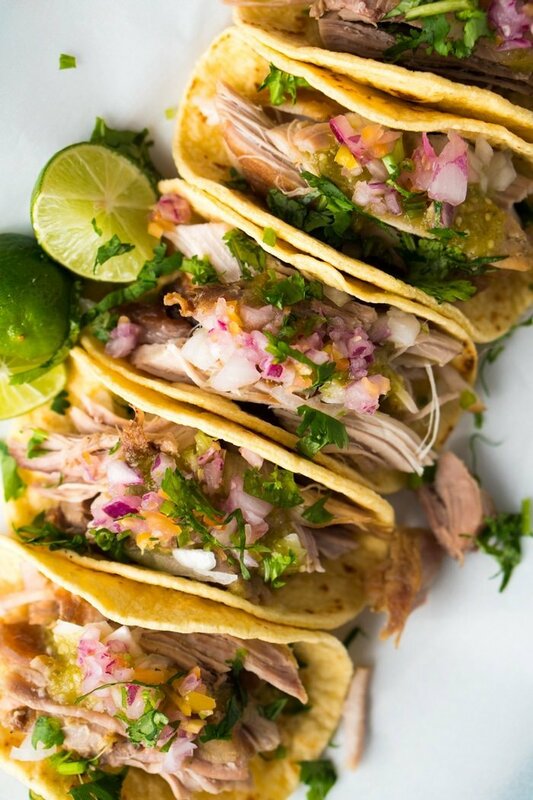 You might not know this, but traditional Mexican carnitas are pork slow-fried in lard. But let’s face it, this is not the easiest process for the average home cook! So I’ll leave those for the taquerias, and use our instant pot to make us some (ultra speedy!) and ridiculously tender and tasty carnitas. And if you haven’t got an instant pot yet (I got mine for Christmas and have fallen head over heels in love! ), you can also use your slow cooker. Just omit the water and cook on low for 6 hours. But whatever you do, I cannot recommend whipping up a batch of our (15 min!) keto tortillas enough. A true match made in heaven! I cannot recommend enough that you take the time to sear the meat, rather than just adding everything together to your instant pot (or slow cooker). These extra 5-10 minutes of prep will give you 100000x more flavor, so repeat after me: sear your meats! Another great tip I learned from a mom’s friend is to squeeze an orange and add the actual orange in to the mix. It’s a bit more subtle than orange zest, but gives you just the right amount of tang! Suggestion numero uno, our grain free keto tortillas. And if whole30 (or keeping it light on keto), go for a romaine lettuce taco. The freshness of the lettuce goes beautifully with the carnitas, and it’s definitely our top choice once temperatures begin to rise! Additionally, (traditional Mexican) carnitas are garnished with a myriad of toppings. Anything from salsa verde (or roja), to minced onions, pickled jalapeños, chile habanero, fresh cilantro… i.e. you’ve got options. Just whatever you do, don’t forget the limes! 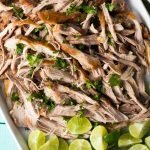 These instant pot keto carnitas are the speedy (and easy!) version of this stellar Mexican dish. 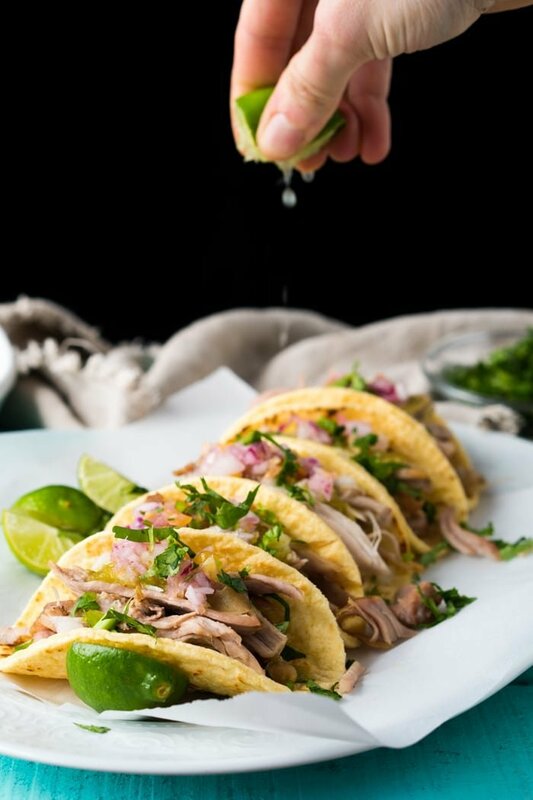 Ridiculously tasty and tender for the ultimate tacos! Add in all the remaining ingredients, squeezing the orange into the mix before adding it in (yes, you want the whole orange in the mix!). Toss to combine. Lock lid in place, close pressure valve and press Meat. Adjust cooking time for 30 minutes and cook. Allow pressure to release naturally (roughly 20 minutes). Remove lid and shred meat with two forks (in the instant pot itself or a tray). Serve right away with desired toppings (limes are non-negotiable!). And if you haven't got an instant pot yet (I got mine for Christmas and have fallen head over heels in love! ), you can also use your slow cooker. Just omit the water and cook on low for 6 hours. Please keep in mind that nutrition facts for this recipe can vary widely. But, think anywhere from 1-3g net carbs per serving is a good rule of thumb. I have a quick question 🙂 Will this l only make 4 tacos? I might make them for a house warming party and I want to calculate how much pork I should buy. Best pulled pork I’ve ever made!! Amazing and delicious. Wasn’t sure that 30 min on normal pressure (the meat button) would be enough, but it was perfect. Limes ARE imperative! 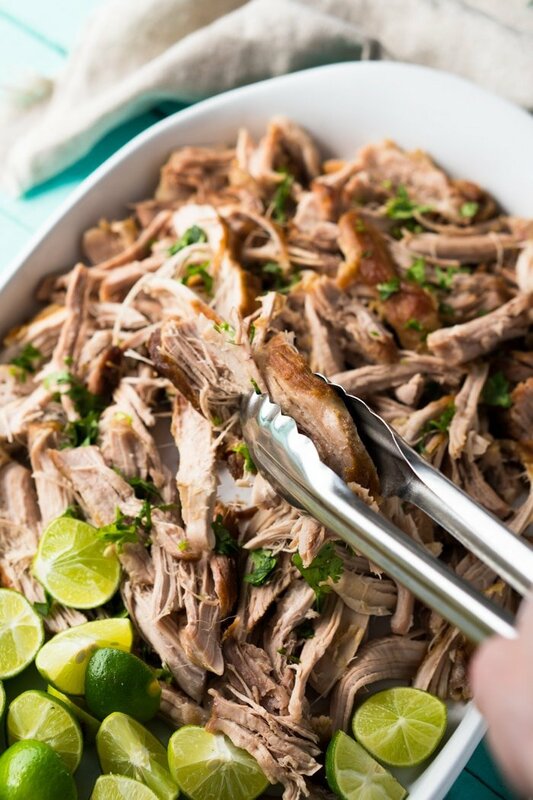 I cringe whenever I see a carnitas recipe adding citrus to it. My father is from the state of Michoacán in Mexico, the birthplace and home to some of the best carnitas in the world. And he never uses any of those ingredients , just plain old salt and some carmelized sugar boiling lard in a copper cauldron . That is what makes it Carnitas, otherwise it is seasoned pork. Hola Laura! Funny you mention it, because my moms family is from Michoacán as well (Morelia is we’re being precise!). It looks like you didn’t read the post, because there I explain that these aren’t your traditional ‘fried in lard’ carnitas…! So no need to be upset about me ruining our heritage lol, I’m just providing an easy at home option with tons of flavor xo! 😂!! I mean I’m not about to ask you guys to buy a copper pot and 10 kilos of lard! Can I use a pork Loin roast? OMG, I browned the meat in a skillet and actually draggged out my beast of a pressure cooker. The taste after browning and seasoning is divine! Can’t wait for it to come out of the pot! I don’t know – I feel like the orange pith from the whole orange made the carnitas bitter. I tried to remove the orange but it just disintegrated. Next time I’ll try using just the juice and zest. When you say throw the whole orange in, do you mean the peel as well? Absolutely delicious! Thank you so much for sharing!! This is only the 2nd time using my instant pot and this dish will definitely be made again. And again. From youngest to oldest everyone at my table loved it, not an easy feat! Thank you!!! is pork just high in sodium? why is the sodium so high? Oh man I’m not sure why, could’ve been that the software picked up high sodium from the garlic powder or spices (some have added salt frequently). I don’t have an instant pot, but I do have a traditional pressure cooker. I presume I can replicate this recipe in that? I used a pressure cooker for 30 minutes. I think it could use a bit more liquid. Wound up with a serious crust in the bottom of the pot. 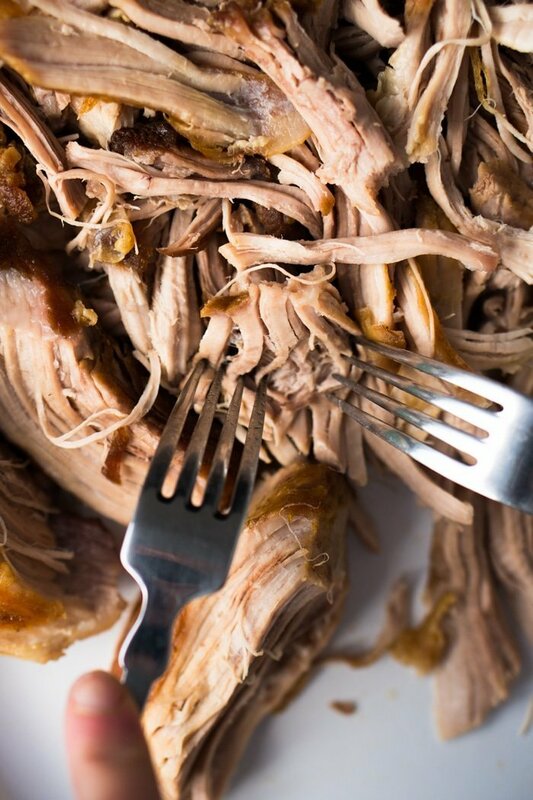 Could you please let me know if I could do the pork in a slow cooker? How long do you think? Hi Alana! Please check out the slow cooker pulled skirt steak for reference on cooking time and liquid needed for the slow cooker xo! Are the macros available for this recipe, minus the tortillas? Oh geez they didn’t post! Give me a few minutes to see what’s up! Nutrition facts are now posted 😉 thanks for the heads up! I just drooled a little…! Excuse me while I clean up my keyboard!